Christmas Time ~Time to feed the Reindeer for Santa! Yes, my little one is so fascinated by Santa. We have told him the true meaning of Christmas. He knows about Santa, but there's just something about a child at Christmas Time. I just love how happy he is. He wanted to feed Santa's reindeer. I told him we could make a special food just for them. I found the recipe for Reindeer food. I will enclose the recipe that is contained in these bags. I will also give the recipe for the bags. I cut them using my Cricut Gypsy. Bag Topper: George & Basic Shapes Cartridge (rounded rectangle) at 7"
Bag itself: standard sandwich bag rolled 2x over or you can use snack bags. Reindeer: Create A Critter Cartridge cut at 2 1/4" with the layers. 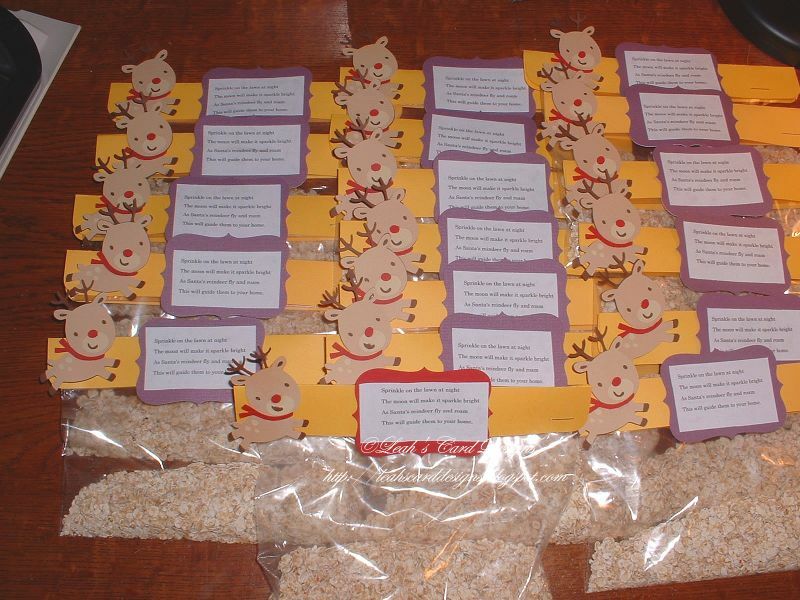 Tag: Create A Critter Cartridge cut at 2"
Sprinkle Red and Green Sugar Crystals in enough to show through oatmeal. Thank you for looking. Hope you have a wonderful Christmas! Feel free to leave a message. Awesome Leah! My bf is gonna love them!! !